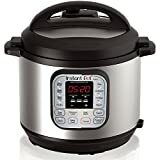 The Instant Pot DUO60 6 Qt 7-in-1 Multi-Use Programmable Pressure Cooker has been the best-selling multi-cooker on the planet for pretty much as long as we can remember at this point. It’s definitely worth every penny of its $100 asking price, but it also goes on sale reasonably often. As you might have guessed by now, one of those sales is happening right now and if you hurry, you can snag the DUO60 for $79.99. It’s a great deal and we doubt it’ll last very long.